Transparency Market Research (TMR) delivers key insights on the global organic pea protein market in its upcoming outlook titled, “Organic Pea Protein Market - Global Industry Analysis and Opportunity Assessment, 2018-2026”. 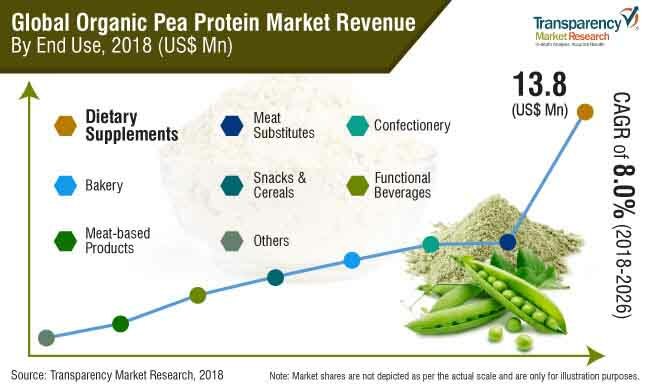 In terms of value, the global organic pea protein market is projected to expand at a CAGR of 8.0% during the forecast period due to various factors, regarding which TMR offers vital insights in detail. The organic pea protein market is segmented on the basis of product type, end-use, and region. On the basis of product type, the global organic pea protein market is segmented into, isolates, concentrates, and texturized. The concentrates segment is expected to increase at highest growth rate with growing incidences of diabetes and rising cholesterol, demand for low fat healthy diet is rising. This has elicited the consumption of vegan food among health conscious population across the globe. Meat substitute’s products are becoming a priority in regular meals as they deliver high national value and low fat diet. Also, increasing standards of living of people and high GHDI are expected to influence the consumption of not-so-cost efficient meat substitutes. This is expected to exert a positive impact on the intake of organic pea proteins in the years to follow. Moreover, manufacturers are undertaking several research and development initiatives to develop superior and novel quality products to cater to the growing demand of health conscious people. On the basis of end use, the global Organic pea protein producers in the end use industry such as dietary supplements, meat substitutes, bakery and confectionery, snacks & cereals, meat-based products, functional beverages and others. Furthermore, dietary supplements is sub-segmented into sports nutrition, protein powder, and others. On the basis of region the global date palm market is segmented into North America, Latin America, Europe, Asia Pacific, and Middle East. Increasing consumer interest towards protein intake has boosted the demand for protein in the global market, with more attention being paid to the type and origin of proteins being consumed. With the desire for a vegan lifestyle, clean label products, organic and natural products, ease of digestion, need to avoid allergens from animal-based products, and concerns about the consumption of plant-based food, consumers are putting the spotlight on plant-based proteins such as pea protein, soy protein, wheat protein, rice, protein, potato protein, and others. Owing to this, the demand for organic pea protein is also expected to increase at a higher growth rate over the forecast period. The millennial population is becoming concerned about their health and their family’s health, which has resulted in an increased expenditure on natural and organic food, as it is perceived to be free from additives, hormones, and antibiotics, and non-GMO. These products are primarily environment-friendly, and produced without the use of any synthetic substances. Hence, consumers, especially the millennial age group, prefer organic products, and this trend is expected to increase the demand for organic protein in the global market. This report covers trends driving each segment and offers analysis and insights into the potential of the organic pea protein market in specific regions. Detailed profiles of the providers are also included in the scope of the report to evaluate their long-term and short-term strategies, key offerings and recent developments in the organic pea protein space. Organic Pea Protein key players includes Farbest Brands, Axiom Foods, Inc. , The Green Labs LLC, Bioway (Xi'an) Organic Ingredients Co. Ltd., The Scoular Company, Vestkorn, YT (XI’AN) Biochem Co., Ltd., A&B Ingredients, Greenway Organics (Tianjin) Co., Ltd, Phyto-Therapy Pty Ltd., Puris, and Maxsun Industries, Inc. The growth of the organic pea protein market is supported demand for vegan and high-protein ingredients driving the growth of plant proteins, high usage of protein in sports and bodybuilding products, increasing demand for organic food products, plant-based food products are at a lucrative nexus of both, health and ethical consumerism, and increasing popularity of private label brands.